One of the things that characterizes the study of psychology is the breadth of professional settings in which it can ultimately be applied. For students like you, that means exciting opportunities to take your interest and intrigue in studying human and/or animal mental processes and behavior on a career path most suited to your individual aspirations and goals in life. More than anything, the field of psychology is concentrated on improving the human condition. It takes individuals who are passionate about blending the intellect and thorough understanding of the science involved, with compassion and a desire to help others. The psychology program delivers a vibrant, active, engaging learning experience within a department that is as closely-knit as any other on campus. You’ll be guided by fun, enthusiastic, accomplished faculty who truly embrace their roles as mentor to their students. In addition to studying the major theories, methodologies, applications, and databases used by psychologists, students also develop essential skills in communication and critical thinking. Small group projects will enable you to bond with fellow students, and you’ll find regular opportunities to take your learning experience beyond the classroom through research, practicums, experiential learning in mental health service organizations, and the activities of Psi Chi and the Psychology Club. Demonstrate a familiarity with the major concepts, theoretical perspectives, empirical findings, and historical trends in psychology. Use critical and creative thinking, skeptical inquiry, and the scientific approach to solve problems related to behavior and mental processes. Demonstrate competence in both verbal and written communication. Demonstrate a passion for improving the human condition through the application of psychological principles to personal, social and organizational issues. Demonstrate ethical behavior reflecting the values that are the underpinnings of psychology and that are incorporated in the Carroll College mission statement. Studying psychology at Carroll offers distinctive opportunities that have the power to distinguish you in the eyes of employers and graduate schools. You may take advantage of opportunities to study abroad in India, experience road trips to the Rocky Mountain Psychological Association conferences, and the kind of personal advising and guidance that can only happen in a smaller, personalized academic setting like you’ll find here. Our students also benefit from an array of internship opportunities to apply knowledge and sharpen their skills at places like Shodair Children’s Hospital, Youth Dynamics Inc., and the Helena Police Department. Career options for graduates of the psychology program are, in a word, boundless. Every year we hear back from our alumni who tell us that our carefully designed curriculum, caring and supportive faculty, distinctive opportunities, and diocesan Catholic mission prepares them very well for the road ahead. 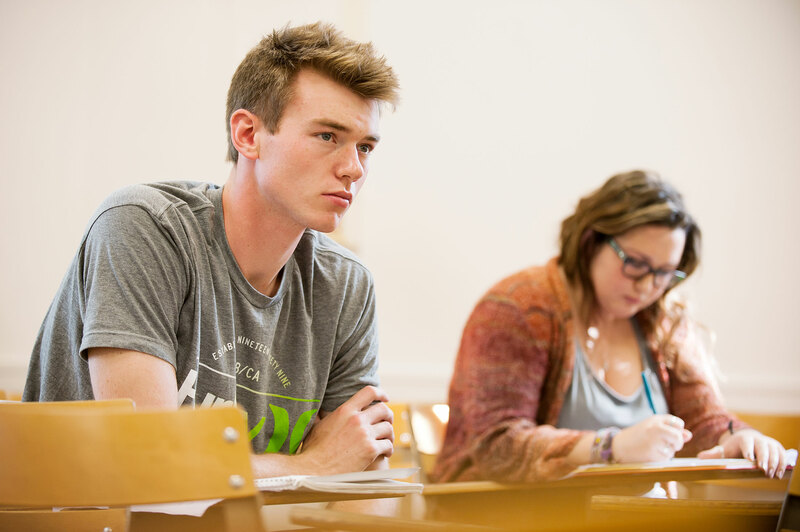 Graduates of the program consistently gain acceptance into respected graduate programs at places like Pacific University, the University of Montana, and the University of Oregon. And you’ll be prepared for a career anything from mental health counseling, community service, social services, and substance abuse services, to advertising, sales, college admissions, public relations, law enforcement, or teaching. In exit surveys our graduates overwhelmingly agree that they are well prepared for their next career step with their psychology degree from Carroll. Students love the road trips to attend Rocky Mountain Psychological Association Conferences. The Psychology Program sponsors a chapter of Psi Chi, the American Psychological Association's national honor society for college Psychology students. Psi Chi provides opportunities for students to become closer to the academic and professional communities in Psychology through conferences, presentations, and special events each year. Psychology students at Carroll may also join the campus Psychology Club. Carroll values and celebrates your individuality. The small student body allows each student to contribute significantly to campus life, all enveloped within an atmosphere of respect for human worth and dignity. Devoted to lives of research and experts in their fields, Carroll professors will share their insights both in the classroom environment and in the field. They are not here just to teach—they are committed to your success. The Psychology department of Carroll College is committed to the full development of our students’ human potential as prescribed in the Carroll Mission Statement. Specifically, the departmental mission is to expose students in the broadest sense to both the applied and basic science of human behavior and mental processes. Through this exposure our students will develop an appreciation for the complexity of the discipline, an awareness of the role of psychology in everyday life experiences, and a passion to pursue one or more specific areas of psychological inquiry. Upon completion of a major in the field of psychology, Carroll College students will be prepared to enter a career in psychology or a related field and/or attend a graduate school program to further their professional training. More generally, the department strives to engage each student in a life-long effort to expand their intellectual capacities, develop a strong moral basis for behavior, and become increasingly aware of their social responsibilities.